What a fun, colorful shot! I love it! Our children frequently open for us a whole new view of ordinary things! Delightful, Robert! Hope your week is going well! Oooo, lovely coloured photo !!! Looks like your daughter likes things neat and tidy. A very good habit. 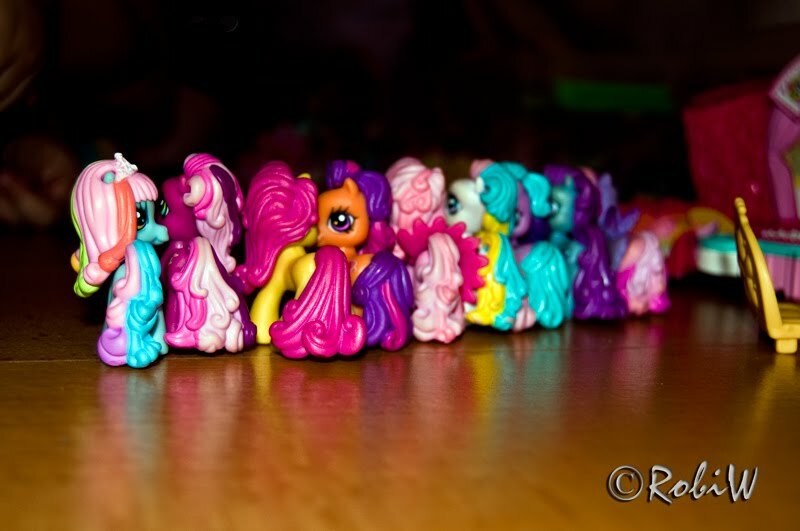 Eye-popping ponies! I like what you do with color! Very good use of limited DOF in this picture, and great colours indeed. Loved them and I remember how I used to play with dolls as a young kid!! Nice colours in this picture, and its almost as i wish to be ten years again. Say hallo to Sylvia from me! Nydelige farger - skikkelige jentefarger! ¡Que buena toma, que original, cuanto color! Sin duda, el mundo es de los niños, por ello debemos cuidarlo y cuidarles. Un fuerte abrazo para toda la familia. Se os extraña amigos!!! My poor english can´t express my feelings!